They say the first place you see signs of aging is the eyes. While I try my best to look blankly at people all day long to delay this process, sometimes I just have to crack a smile or gasp at the newest arrival on Moda Operandi and must rely on my eye creams to do damage control. 1. Perricone MD Acyl-Glutathione Eye Lid Serum - Don't ask me to pronounce it, but please ask me to use it. While most eye creams are designed to be used around or under the eye, this product is actually suited for the lid, which is one of the most delicate parts of the face. Crepey skin comes a creepin' fast on the eye lids so this helps to immediately smooth and tighten, making for an excellent primer before putting on eye shadow. 2. Mario Badescu Ceramide Eye Gel - Dehydrated and puffy eyes have met their match with this product. I personally leave mine in the refrigerator a few minutes before I apply, and find that it's like my own little spa treatment. Lightweight and instantly absorbed, this is my daily staple at helping to fight every known eye ailment out there - puffiness, dehydration, lines, wrinkles - ugh who invited them? NOT ME. 3. Tatcha Ageless Revitalizing Eye Cream - Every now and then you need to bring in the big guns for those days where sleep evaded you, laughter was running rampant on your face or the weather elements seem hell bent on destroying any remaining moisture left in your skin. A tiny (and I mean minuscule) dab of this rich, luxurious cream will help to immediately hydrate, nourish and brighten around the eye. Lines? What lines? This cream will help you laugh (just a small chuckle now - remember the rules) in the face of aging. 4. 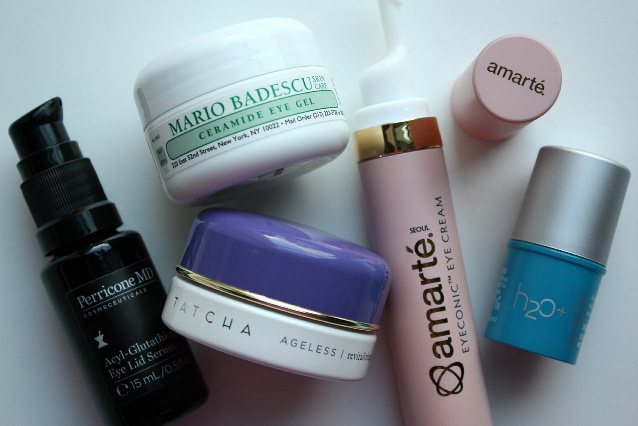 Amarte Eyeconic Eye Cream - If the amazing formula packed with pure retinol doesn't lure you in, then the fact that it can be used on both the eyes AND lips is sure to seal the deal. A product that gives double duty is a product to smile about - but not too big, and for not too long. 5. H2O+ Eye Oasis Instant Hydrating Stick - No muss, no fuss when it comes to this quick fix. Immediately cooling and perfect at helping to instantly de-puff, this little miracle stick is essential after a night out. And don't be surprised if the man in your life steals it, men love the ease and refreshing sensation of this product. But don't expect them to put the cap back on - they are still MEN after all. Only a few more days to enter my giveaway!!!! Click here to enter. So cool you can use the Perricone on your lids! GIMMIE! That is why it is one of my favorites - it makes it so unique! I'm really enjoying your blog! I just bought a few things through Barney's online, and I almost got the Tatcha Powder & a moisturizer. Now I want the eye cream too! I think I have about five eye creams going, so I can't really justify that right now. But it's definitely on my WishList. It was really helpful reading your thoughts on the Tatcha powder. Also on my WishList! Have you tried the moisturizer?